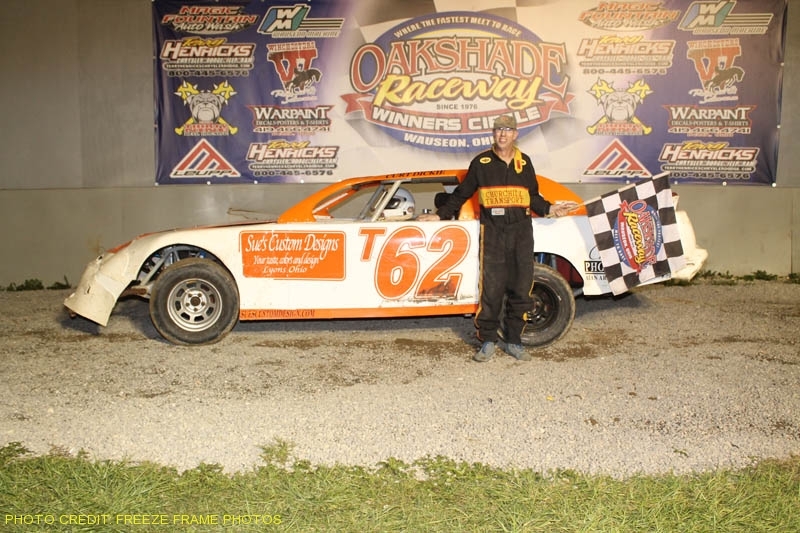 The month long “Hell Tour” UMP Summer Nationals series wrapped up at Oakshade Raceway With Rusty Schlenk earning his first ever Birthday Race win after a third place a year ago. He beat 57 other competitors representing three countries and some of the fastest dirt late model drivers around. Fast qualifier Doug Drown out of Wooster, Ohio, started on the pole of the 60-lap feature event, but Dennis Erb out of Carpentersville, Illinois, launched out the lead at the start from outside the front row. Rusty Schlenk started fourth and quickly positioned himself in second. Schlenk dropped to the inside of Erb to challenge for the lead by lap three, but after several laps, could not pass the leader. By lap 25, Schlenk closed back in for another shot at taking the lead from Erb and finally took command on lap 29. The only yellow flag came out after Jon Henry’s strong run came to an end when he went over the banking of turns one and two. After the restart, Schlenk began to turn things up as he marched away from some of the country’s best drivers. A great battle ensued for second through fifth about a straightaway behind the race leader. Dennis Erb, Ryan Unzicker, Donnie Moran and Jack Sullivan from Greenbrier, Arkansas all battled in a tight pack. In the end, Rusty Schlenk picked up the check for $10,000 and finally added his name to the elite list of drivers that have won this prestigious event. Sullivan was on a late race tear that earned him a second place finish. Ryan Unzicker started 14th and picked off 11 positions to finish third. Dennis Erb slipped back to wind up fourth with Donnie Moran fifth. Jeep Van Wormer gained the most positions having to take a provisional to start 19th and he ended up sixth. Doug Drown, Matt Miller, Jason Feger and Russ King were the rest of the top 10 finishers. Feger was crowned the 2010 UMP Summer Nationals series champion. The UMP Bomber A Main kicked off with a big wreck on the backstretch on the first lap that involved Danny Hogrefe, Matt Lane, Billy Brown, Bob Krumm and Dan Shaffer. A nice three-wide battle took place after the restart between Jeff Foks, Chris Henry and Terry Rushlow. Foks eventually got the advantage and Henry spun on lap two forcing him to restart at the rear of the field. Foks continued to lead the entire distance of the caution-plagued race. Curt Lancaster got by Rushlow for second by lap four and wound up finishing there. Jeff Geis finished fourth just behind Rushlow with Jim Scout rounding out the top five after starting 15th. Joe Smith picked up his second Hornet feature win of the year after holding off challenges from the defending champion Derek Morris. Morris pressured Smith the entire distance, but could not get by Smith’s 71 car. William Cundick and Dylan Herman had a heated battle for third all the way to the checkered flag with Cundick taking the position. Dylan Gensler was fifth. Jesse Moyer led the entire distance of the UMP Bomber B Main, but not without a close call. Joe Cordes was putting the pressure on for the lead as the two drivers came up on a lapped car that held up Moyer allowing Cordes to make the pass. Moyer caught a break as a wreck involving Dean Taylor, Allen Tolles and Jack Garland brought out the caution flag saving Moyer’s lead. Moyer went on to pick up the easy victory while Dan Bleikamp won a hard fought battle with Cordes for second. Josh Montague finished fourth with Kevin Cole working his way to up to finish fifth after starting 22nd. Jim Remley led much of the UMP Bomber C Main, the final event of the night. Jake Gamber started deep in the field and closed on Remley late in the race. Gamber took the lead with two laps to go. Gamber went on to pick up the victory with Remley having to settle for second. Ron Travelbee, Nathan Goodman and Tim Zuver were the rest of the top five finishers. The “Night of Wheels” returns as part of a full racing program on Saturday, July 24 at Oakshade Raceway. Bicycles donated by drivers, crews, fans, etc. will be given away to a bunch of lucky kids at intermission. There will also be a “Dash for Cash” sponsored by Racer’s Connection for the UMP Sportsman division in addition to the regular racing action. Gate open at 4pm with racing at 7pm.